In 2004, Haicoole unveiled the California DeLorme Challenge. Now, just about every state has a DeLorme Challenge. Arizona is long past due for getting one of our own. The goal... to find a cache from each page in the Arizona DeLorme Atlas & Gazetteer. The DeLorme Atlas & Gazetteer is published for all 50 states. These map books are a favorite among travelers and outdoors-people. They are available at truck stops, travel plazas, your local discount store and directly from DeLorme. You do not have to buy a DeLorme atlas to complete this cache, but it may help. The goal of this cache is simple: to find at least one cache on each and every grid block of the Arizona DeLorme Atlas & Gazetteer. Every grid block has its own page in the Atlas. You will be provided with the coordinates for the final cache when you have successfully documented finding a cache in each map page of the Atlas. Arizona is divided into 52 map pages in the 2008, Seventh Edition of this popular map book. You will need a high clearance vehicle to reach the start of the hiking trail. There is a short section of crawling along a rocky wash bed. After you reach the parking spot, the hike is about .7 miles with an elevation gain of about 450 feet. The offtrail section is pretty flat, and if you've made it up the trail, the offtrail section will be no problem. Note: As of December 2012, we have moved the final location to eliminate the steep shelf climb mentioned and pictured in earlier logs. In order to claim this cache, you must first send us a file containing a list of caches you have found, one per DeLorme book page, that proves you have completed the Challenge. We don’t want every single find you’ve ever made, just the ones you are using to substantiate your claim to have completed the Challenge. .GPX is highly preferred, although .LOC format is a close second. You can email your file to us here. A good way to keep track of your progress: Create a public shared bookmark list of the caches you want to use to claim the Challenge. Don't forget to add this cache (GC1AHJN) to your bookmark list so that it will show up here. You can take a look at our list for an example. When you are done, just email us a note that you are ready. We can then go to your bookmark list and click the button to create a pocket query from your list, which we can then receive in .gpx format. We will review and verify the list. Once everything checks out, we will then send you the correct coordinates for the final cache! The find cannot be logged until the physical container is found and the logbook inside is signed. As mentioned above, the posted coordinates are not the actual coordinates for the cache. The actual cache may in reality be quite some distance from these coordinates! Placement of a cache on a DeLorme Atlas page does not count as finding a cache. Caches found and logged online prior to the publication of this cache do count towards pages found. While it is preferred that you list currently active caches, archived caches will count if you made the find while the cache was still active. The 2008, Seventh Edition of the DeLorme Atlas & Gazetteer for Arizona is the freshest version available at the time of this cache posting. It shall be the definitive version of the Atlas for the purpose of this Challenge. For ease of verification and to avoid arguments, please try not to use borderline caches in claiming the Challenge. In the 2008 book, there is a blue border delineating the boundaries of the grid block on each map page. Each page has a "collar" area outside of the blue border belonging to adjacent grid blocks. Your cache find claim for that page must be within the blue border. If an Arizona Atlas page includes space not located in Arizona, only caches in the Arizona portion count. We will go by the posted coordinates for a cache when determining in which state or page a given cache falls. When in doubt ask — we can discuss it or even seek guidance from others, but the final decision rests with the cache owner. Again, many thanks go out to Haicoole for the original idea for this cache and to the other cache owners who have taken the idea and run with it for their own states. 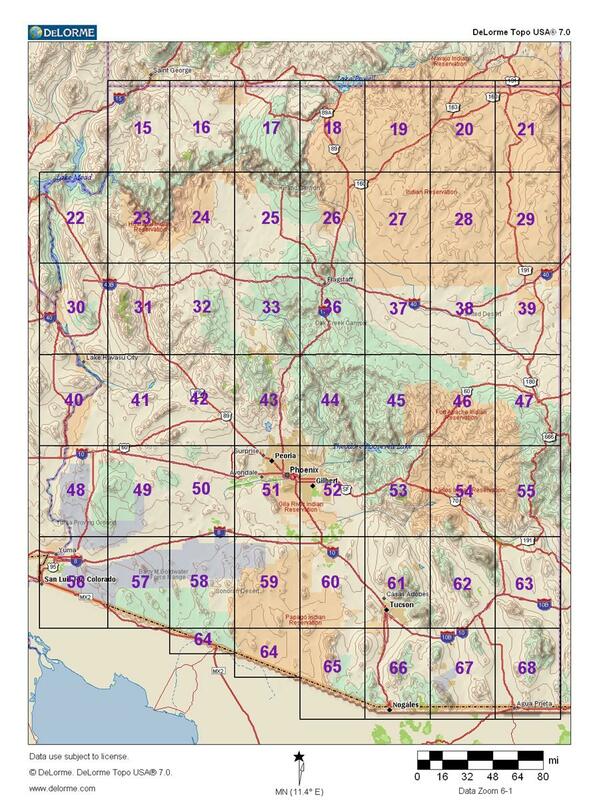 DeLormeGrids.jpg A jpeg image file showing the 2008 numbering of all the Arizona DeLorme Atlas grids. Yes it was different in prior editions. AZ-DLCGrids.txt A text file that can be imported into DeLorme mapping software as a Draw Layer to show the boundaries of the Arizona DeLorme Atlas & Gazetteer pages. AZDeLorme Grid.gdb A Garmin Mapsource .gdb file to show the boundaries of the Arizona DeLorme Atlas & Gazetteer pages. Challenge.gsk A GSAK macro to analyze your finds, spit out a list of qualifying finds, show what grids you still need, and will show it all on Google Earth. Thanks to Hynr (original author) and Corfman Clan (Arizona mods)!